More than a billion people across the globe lack access to safe drinking water because the galloping population rate has lowered the level of ground water to an alarming level. It is fast becoming a rare commodity all over the world, and in some regions it is even costlier than the milk. In Pakistan, 38.5 million people lack access to safe drinking water and contaminated water is one of the biggest sources of spread of water-borne diseases like cholera, typhoid, Hepatitis A & E and diarrohea costing its economy a cool $1.3 billion a year. Not only backward rural areas, but also congested urban centers are confronting this serious problem. Children are especially vulnerable to these disease and an estimated 250,000 children in Pakistan under the age of five die every year. The World Health Organization (WHO) has reported that 60 percent of infant deaths are caused by water-borne infections. According to a report of the Pakistan Council of Research in Water Resources (PCRWR), the mortality rate of under-five children due to ill-water conditions is 101 per 1,000 children. 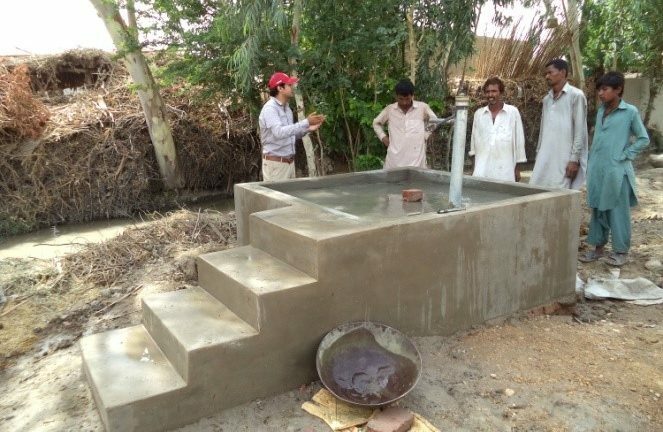 In its endeavor to ensure the availability of safe drinking water to the vulnerable people, the Pakistan Red Crescent (PRC) with the support of the International Federation of Red Cross Red Crescent (IFRC) has installed six lead line hand pumps under the “Integrated Community Based Risk Reduction (ICBRR)” project in Bagh Khan Jatoi and Rano Meghwar villages, Sanghar district, Sindh. Easy access to safe drinking water was an acute problem in these villages affecting the life style, health and livelihood of the inhabitants. The proposed project aims to provide safe drinking water to improve health, hygiene and the overall well-being of the villagers. Both villages were facing the problem of safe drinking water, as the underground water is contaminated and the primary source of drinking water is open canals three kilometers away. Women and children usually fetched water from the canal that would consume one or two hours every day. Moreover, the open canal was at the risk of getting contaminated by external particles increasing the vulnerability of the local population to water-borne diseases. After installing the lead line hand pumps, the PRC team visited both villages and had discussions with the Community Based Organizations (CBOs) about the new facility. The villagers were full of praise for the PRC, Sanghar. So far, around 500 households have access to safe drinking water. Moreover, under the project the communities have been empowered to deal with and manage common illnesses and injuries through the trained Community Based Health and First Aid (CBHFA) volunteers and staff.